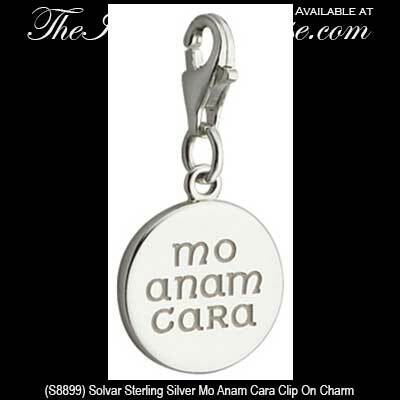 This sterling silver Irish charm is enhanced with the engraved words mo anam cara. This sterling silver Irish charm features the engraved Gaelic words for my soul mate, mo anam cara. The disk shape Irish clip on charm measures 1/2” wide x 7/8" tall and it includes a lobster claw catch. This Irish charm made by Solvar Jewelry in Dublin, Ireland and it is gift boxed complements of The Irish Gift House.